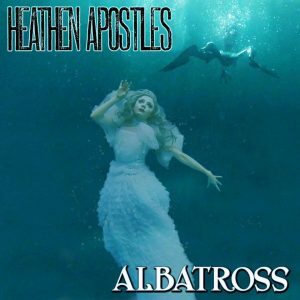 As a final parting gift to 2016, Mather and the Heathen Apostles are releasing their latest single “Albatross” this Friday, December 9th. The band is currently editing the corresponding video, which will also debut on the 9th- stay tuned for news on how to download a copy once it becomes available! November 1, 2016 | Categories: Uncategorized | Comments Off on Happy Halloween/Dia De Los Muertos! 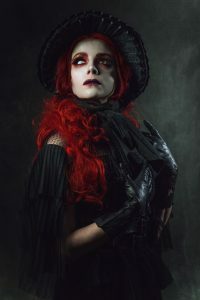 Recently, Chopper and Mather had the honor of working with renowned macabre photographer Chad Michael Ward for some brand-new portraits, just in time for the Halloween season. 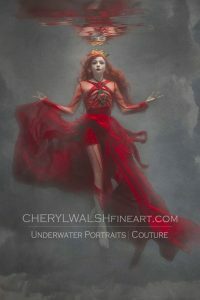 Check out some of the fruits of their collaboration below, and also be sure to check out more of Chad’s work at http://thechadmichaelward.com/ – he is always booking for commissions and is well worth it! 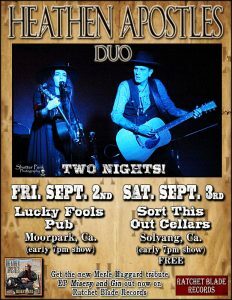 This Labor Day weekend, Chopper and Mather will be hitting the road as the Heathen Apostles Duo for another set of tour dates in Moorpark and Solvang. 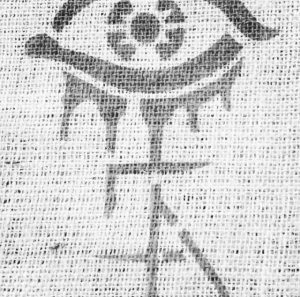 Friday night, they will be joined by Medicine Hat at Lucky Fools Pub, and will be playing two sets at Sort this Out Cellars in Solvang the next night. If you’re local to either city, come out and show your support- both shows are FREE! 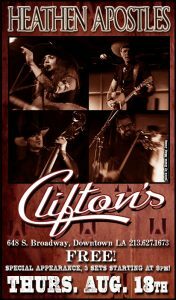 The Heathen Apostles will be making a special appearance this Thursday, August 18th at the legendary (and recently remodeled) Clifton’s in Downtown Los Angeles. 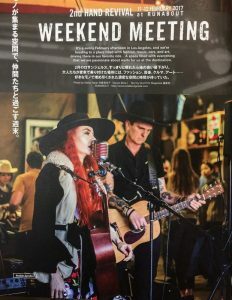 This time, they will be playing 3 sets bluegrass-style (no drums) starting at 9pm, and will be performing their takes on classic tunes as well as acoustic versions of original songs. The best part is, there’s NO COVER for the evening, so come and explore, and pick up an album or t shirt to show your support for the band! “Misery and Gin”, the latest EP from the Heathen Apostles, releases this Friday, July 22nd on Ratchet Blade Records! The EP, recorded in tribute to the late, great Merle Haggard, contains two covers from the outlaw country legend’s impressive catalog- “I’m Gonna Break Every Heart I Can”, and of course, “Misery and Gin”. As a bonus, the EP also contains an off-the-wall remix of “I’m Gonna Break Every Heart I Can” by Almighty Watching. Buy advance tickets to tonight’s show HERE. 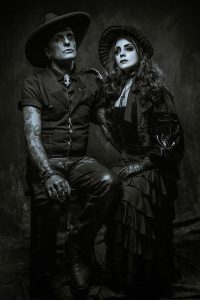 The Heathen Apostles will be releasing their Merle Haggard tribute EP Misery and Gin on July 22nd on Ratchet Blade Records, just in time for Mather’s birthday on the 23rd! 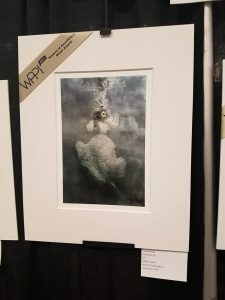 It will feature the two songs the Heathens performed in May at the Merle Haggard tribute concert- “Misery and Gin” and “I’m Gonna Break Every Heart I Can”. The EP will also feature a remix of “I’m Gonna Break Every Heart I Can” by Almighty Watching. 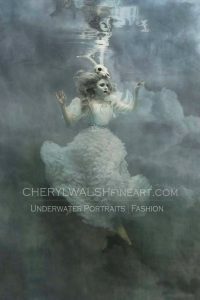 A release show has been scheduled for July 21st at The Viper Room in West Hollywood, CA. Also appearing will be Charlie Overbey and Paul Cauthen. 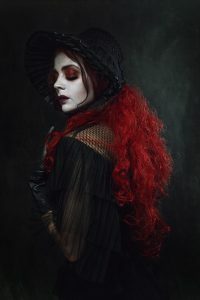 The Heathen Apostles sat down with Nadia Carmon of SYMBOLS magazine recently for an interview about a variety of topics spanning from the songwriting process (and corresponding creation of music videos), influences, REQUIEM FOR A REMIX, and more. 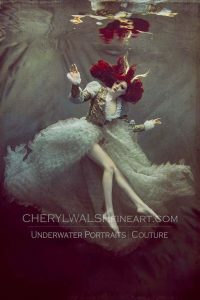 The article is accompanied by a set of brand-new, never before seen photos by Holly West, with MUAH by Ashley Gannon. 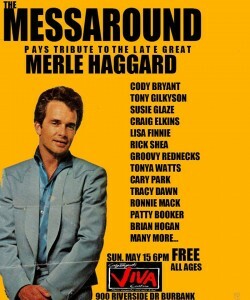 This past Sunday, May 15th, Jonny Whiteside pulled off yet another fantastic edition of The Messaround- this time, paying tribute to the late, great Merle Haggard. 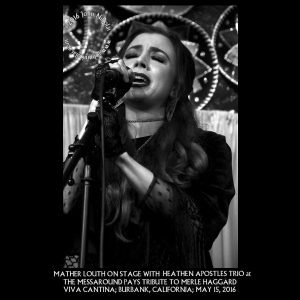 Mather, Chopper, and Luis of the Heathen Apostles were honored to perform “Gonna Break Every Heart I Can” and “Misery and Gin” in Merle’s honor along with over a dozen other fantastic local performers! 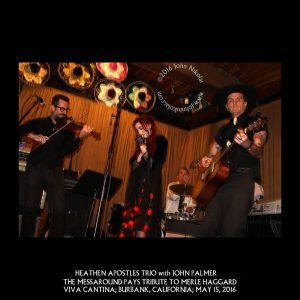 Check out some images of the Heathen Apostles Trio below, and remember: the full Heathen Apostles lineup will be appearing on May 28th at Spike’s for REV IT UP! 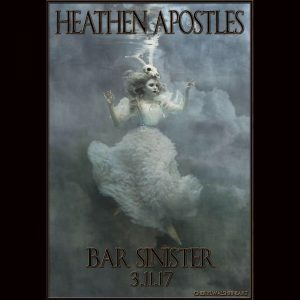 The Heathen Apostles will be making an appearance as a full band on Saturday, May 28th at Spike’s Bar and Billiards for another edition of Brando Von Badsville’s REV IT UP! Our friends Resurex will be headlining that evening, and the bill also includes Dead Girls Corp. and DJ Von Badsville. 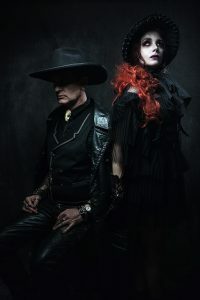 This just in: Jason Palmer of Uber Rock has shared kind words for REQUIEM FOR A REMIX, calling the latest Heathen Apostles release “a great mix of Goth and Industrial, helped along by the fact that Mather Louth has a great voice which at times is almost Siouxsie-esque.” If you haven’t done so already, you can purchase the album in both digital and physical form on the Heathen Apostles Bandcamp. 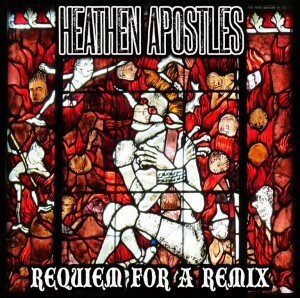 In case you missed it, the Heathen Apostles have a corresponding promotional video for all of the tracks from their latest release REQUIEM FOR A REMIX. The video is comprised of bonus, outtake, and some brand-new footage shot over the course of the band’s releases. 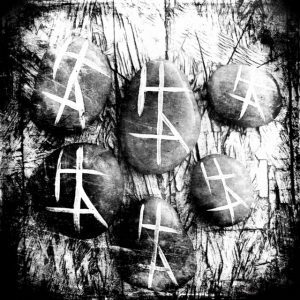 If you like what you’re hearing, head over to the Heathen Apostles Bandcamp to get your copy of the album- limited edition DJ copies are almost gone! 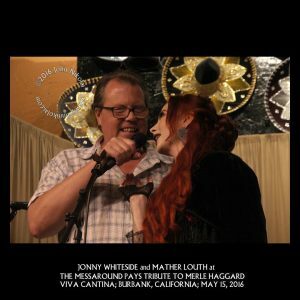 On Sunday, May 15th, The Heathen Apostles Duo is honored to be appearing in Jonny Whiteside’s Messaround for a very special tribute to the late, great Merle Haggard. The tribute show is all ages, no cover, and will feature a great roster of performers including Cody Bryant, Ronnie Mack, Tony Gilkyson, Brian Hogan, the Groovy Rednecks, and more. 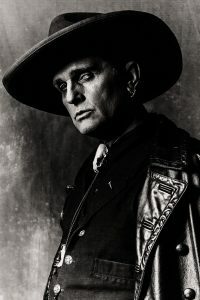 Jonny Whiteside’s Messaround pays tribute to MERLE HAGGARD at Viva Cantina, 900 West Riverside Drive, Burbank, CA 91506; Sun., May 15, 6-9 p.m.; all ages; no cover. FREE PARKING across the street at Pickwick Bowl (same owners). 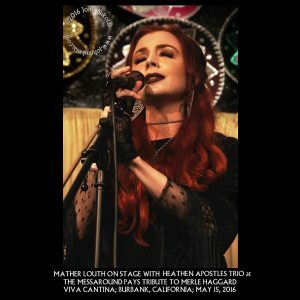 Mather will be appearing on The Polina Hryn Show on President’s Day this Monday the 15th. 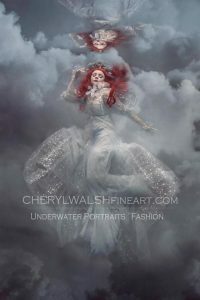 The show’s theme is “The Creation of Image and Sound of a Bygone Era”, and as such, Mather will be discussing her work with Heathen Apostles in addition to her career as an esteemed fine arts costume model. 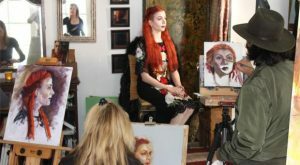 Holly West and Jessamyn Rose will also be featured guests on the program. Tune in to watch the interview live HERE on Monday, February 15th at 1 PM PST.